For those trips that require power, capability, and style, the 2019 Ford Edge has everything you need. With advanced technologies to make your rides as relaxing as possible, and engine options to help you power through all conditions, the Edge is the SUV everyone needs in their life. The 2019 Ford Edge brings power and torque to the center of the stage with its twin-turbo 2.7-liter EcoBoost engine. With a specialized collaboration of power, handling, and efficiency, the Edge boasts an available 335 horsepower and 380 lb.-ft. of torque, meaning you'll be ready for any tough jobs that come your way. Ford continues to step into the future with advanced functionality and safety features. 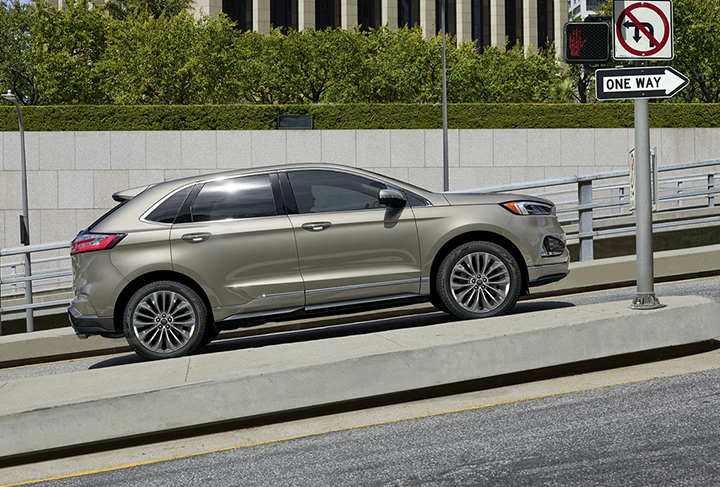 With the integrated Co-Pilot360 system, the 2019 Edge uses a combination of cameras, ultrasonic sensors and radars to alert drivers to hazards and obstacles on all sides. With the bold, powerful look of a Ford SUV, along with a new aerodynamic flavor, the 2019 Edge is a glimpse into the next generation of sport utility vehicles. Sporting sharp contour lines and a dominating presence on the road, you'll definitely be turning heads.